A drug trafficker who was caught with high purity cocaine hidden in fishing waders and a stun gun disguised as a police torch was jailed. 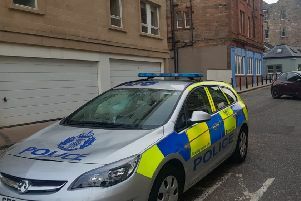 Armed police turned up at Neil Flynn’s home in Edinburgh and the weapon and drugs were recovered after a search of the house and an adjacent property. Advocate depute Maryam Labaki told the High Court in Edinburgh that search warrants for the two properties owned by Flynn in Glendevon Avenue were obtained following police intelligence. Flynn, 45, was detained and a search carried out at his home where the stun gun, which appeared to be a torch marked ‘police’, was found in a bedroom along with £2380 in cash. More than three quarters a kilo of cocaine was found hidden inside a pair of waders at the other property along with two sets of scales. Ms Labaki said the 778 grams of cocaine recovered was tested and found to be 82 per cent pure - far in excess of the normal level of purity for the drug in east Scotland where at street level it is on average 28 per cent pure. She said the drugs had the potential to be worth more than pounds 90,000 if cut into gram deals. The stun gun and torch was found along with a carry case for the electronic device which was also marked ‘police’. During an interview, first offender Flynn confirmed he owned the two properties and said he lived in one and used the other for storage. Flynn admitted being concerned in the supply of the Class A drug at the two addresses in Glendevon Avenue on February 6 last year. He also pleaded guilty to an offence under firearms legislation of illegally possessing a stun gun disguised as a torch. The firearms offence carries a minimum sentence of five years imprisonment unless exceptional circumstances are established. Defence counsel Gordon Jackson QC asked that Flynn be allowed to retain his liberty ahead of sentencing. Mr Jackson said Flynn was a roofer to trade and had his own business and wanted to finalise its running down. But the judge said that Flynn had the best part of a year to put his affairs in order and remanded him in custody. Lady Carmichael deferred sentence on him until next month for the preparation of a background report. The Crown has also brought a confiscation action against Flynn to seize any crime profits.